Now, you should have your business cards by now. But, if you've been scrambling and haven't had a chance yet, I've rounded up some of my favourite pre-designed cards from around the web! 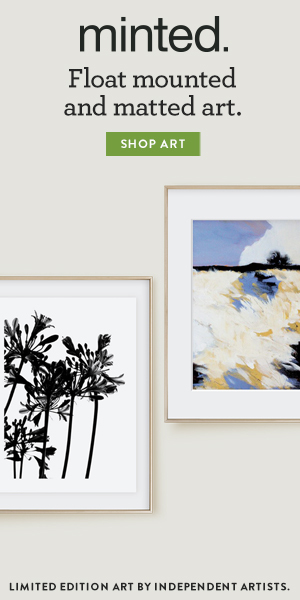 Moo, Minted, and Etsy all have gorgeous options that look custom. (um, hello foil pressed!!) You'll have to check shipping, but most of these should get here on time with rush options. Bonus: some of these are instant downloads so you can customize & print them yourself! I'm still using the same business cards I designed last year, but I wanted to show you what you get from two different online printers, if you decide to design your own. I ordered some from Moo.com last year, but then worried it wasn't enough, so I ordered even more from Vistaprint. Mostly because yes, Vistaprint was less expensive, but I was also curious to see how they'd compare to the Moo cards. If you've posted about your business cards I'd love to see them! Or if you have thoughts on any other printing companies? I've never used Minted for business cards, but I have & love several of their art prints & I think the quality would be the same. Can't wait to see some of you at BlogPodium this year! There's still a few tickets left!